Who Joe Mariani is and how he ended up buried in Forest Home Cemetery has been a bit of a mystery. Above the portrait on his gravestone is the symbol for International Workers of the World (IWW). A British researcher believes the initials, O.M.P. to mean Order of Mutual Protection, a mutual society (some echoes of freemasonry) founded in 1878 offering death, sickness, and injury benefits to members. The organization still exists as the Artisan Order of Mutual Protection with its own website. O.M.P. probably covered burial costs for Joe Mariani. 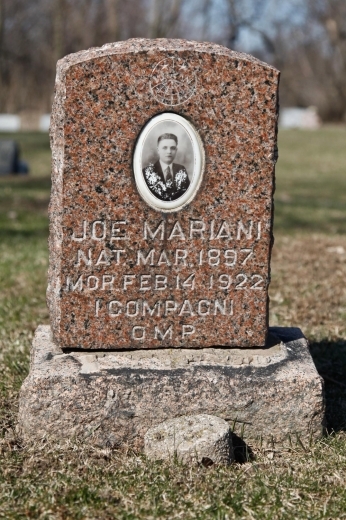 Joe Mariani, a handsome 25-year-old, passed away on February 14, 1922 and was buried in Forest Home Cemetery. His grave was marked with an impressive granite headstone. It's only sixteen inches tall but skillfully decorated. Joe's features can be seen in an oval porcelain portrait. Above this is the insignia of the Industrial Workers of the World (IWW). The inscriptions are in Italian and end with the words, "I Campagni OMP." Joe would never have come to my attention, if it hadn't been for "Cemetery John" Martine. John is a Maywood resident, who belongs to the Association of Gravestone Studies (AGS). During one of his frequent strolls through Forest Home, John found Joe's headstone had toppled from its base. He contacted his colleague, Ta Mara Conde, a national expert in gravestone restoration. Ta Mara is President of Historic Gravestone Services in New Salem, Mass. For fifteen years, she has made a good living fixing headstones in historic New England cemeteries. 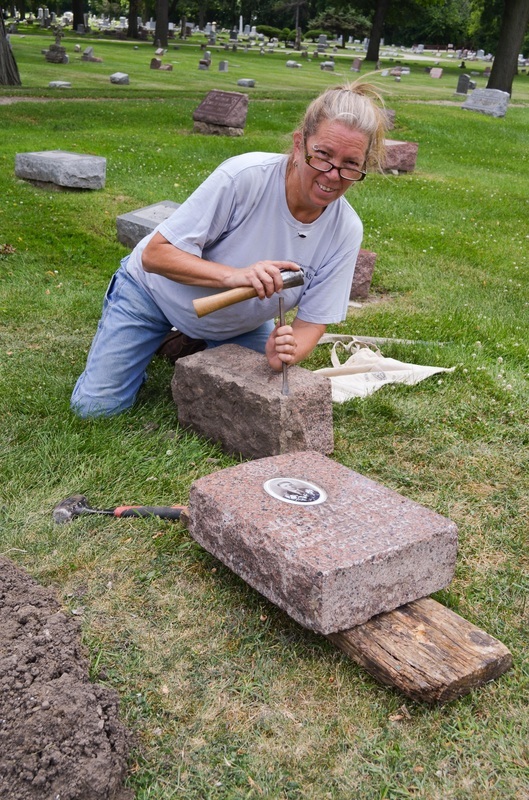 She happened to be "nearby" restoring stones in Ohio when she got the call and agreed to re-set Joe's stone for free. Historical society member Mark Rogovin provided Ta Mara with lodging and garage space for her pick-up. The bed of her truck was loaded with the tools of Ta Mara's trade: shovel, level, a lift for large stones and a milk crate for sifting dirt. Ta Mara was drawn to cemetery conservation by a childhood tragedy. When she was five, her 19-year-old brother, Bill Bachman, was killed in an auto accident, while on leave from Vietnam. "First we got a box from Bill, then we got Bill in a box," she said. Ta Mara accompanied her inconsolable mother on daily visits to Bill's grave. The little girl became very comfortable in cemeteries. After studying art and history, she saw cemeteries as "museums." She learned, however, that the elements take a toll on the collection. The stones can be toppled by freeze-thaw cycles, tree roots and of course, vandals. 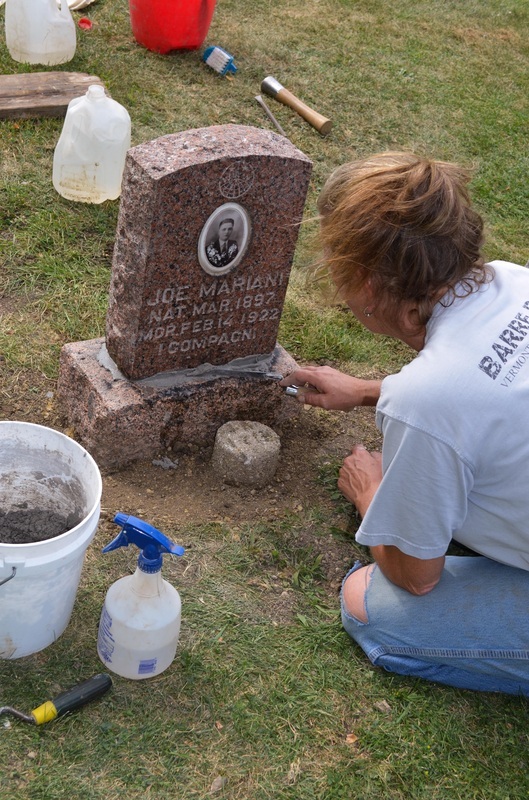 Last week, Ta Mara spent five hours re-setting Joe's stone. The biggest job was removing the headstone's foundation stone. This stone was so large and heavy, cemetery workers used a backhoe to lift it. Ta Mara laid down a level bed of sand before the stone was returned to its resting place. She then mixed mortar and secured the headstone to the foundation. "Cemetery John" watched the whole process. He had also developed interest in cemeteries at a young age. While some families might head to Disneyworld, John's family visited cemeteries on their family vacations. He met Ta Mara eleven years ago at an AGS conference in Savannah, Ga.
Now that Joe's headstone has been re-set, an air of mystery still lingers. John Martine could not decipher the inscriptions on the stone. I did some digging by contacting labor historian, William LeFever, at Wayne State University. He couldn't find anything on Joe because the government seized the IWW's membership rolls in 1919 and later destroyed them. At the IWW website, there was a brief note about Joe. He reportedly joined the labor union, "At a time when being a member of the IWW could result in a prison sentence." So, our man in Forest Home was no regular Joe. I say we should leave no stone unturned until we find out who he was.